We are excited to announce that we have leased 4,125 square feet of office space at 30Avenue! The sophisticated village center, whose construction is well underway, anchors the gateway to Scenic Highway 30A at the intersection of Highway 98 near the new urbanism communities of Rosemary Beach and Alys Beach. Our Owners Blake Morar and Chris Abbott met with 30Avenue Developer Bryan Corr at our existing location on 30A in Blue Mountain Beach Monday afternoon to finalize our agreement. It is truly tremendous for our business, as we have operated out of one office for over 15 years. Adding this prominent office location is a big, but exciting change that will allow our agents to provide their customers on the east end of 30A with an even greater level of service. 30Avenue is a natural first stop for travelers coming to 30A from Northwest Florida Beaches International Airport. 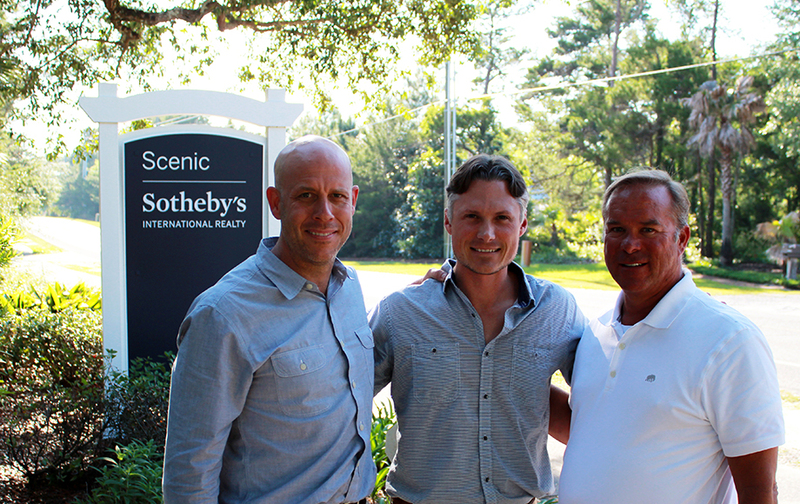 We’re eager to leverage the global recognition of the Sotheby’s International Realty® brand at this location, and confident that our presence there will attract further attention to the luxury properties of Rosemary Beach, Alys Beach and WaterSound Beach. Scenic Sotheby’s International Realty will occupy the 2nd floor of Building D in Phase I of 30Avenue. Phase I is expected to be complete this July. We anticipate our new office location will be open late this fall!